"A sheer pink with pink glitter"
This is a cool toned nudey pink and it applied very smoothly with no streaks. It feels very comfortable on the lips and lasts a really long time even through eating and drinking. Since it is a satin finish, it does transfer but you can tell that there is still a lot of pigment left even after a kiss test so the color really clings onto your lips and it is there to stay. This is a really pretty dark eggplant purple and also very unique and bold. It is full on purple so it matches the theme of the collection very well. The formulation of this is pretty good. It's not streaky or patchy and one swipe did the trick. Very pigmented, lightweight and does not bleed or transfer. Next up, we have the three Super Shock Shadows that are sold as singles for $5 each for 2.1g/0.07g of product. All of these have sparkles so if you love glitter, you will enjoy these and if not, stay away from them. The colors look really fun and vibrant and once the pigments set, they do not budge or fade. I say that from personal experience but bear in mind that I have single eyelids so I do not face the problem of creasing and transferring on my eyelids. If you watched my video, you'd know that I swatch my shadows lightly. I don't go all ham on it and press and swirl it. 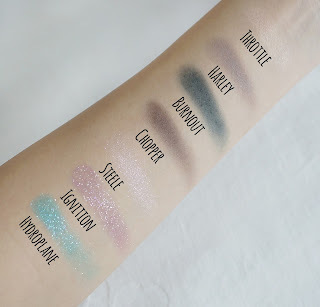 You can get pigmentation with any shadow if you use that much effort in picking up product. You can tell that the textured design of the shadow is still intact after my swatch so I really am using minimal effort to pick up the product so you can judge the pigmentation of the products for yourself. "A metallic pastel pink with multi-dimensional glitter"
I love ColourPop's metallic shadows but this was pretty sheer and light on my skin (which seems to be the trend among most of CP's light metallic shades). It almost doesn't show up unless you look at it under direct light. I did two swipes for this swatch. There are a ton of pink, purple, blue and silver glitter on it but it is not the sparkliest among the three and the pastel pink is very very light. It will probably show up more on darker skin tones. Loving the sparkle here but it applied a tad light and sheer? I mean, I thought it would be a smidge darker or opaque. I found that a lot of pigment and glitter remained on my finger after swatching and it was hard to transfer and build the color on my lids. You might want to try a sponge tip applicator with this one. Absolutely love teal colors and they make a great pop of color to any look. The campaign pictures also feature Amanda Steele wearing this all over her eyelid with a wing and that is such a bold and daring look to pull off if you are feeling up to it. It is super sparkly and although it didn't swatch as intensely as the campaign pictures, it is still rather buildable. This is ColourPop's first ever pressed powder eyeshadows and first ever palette so it was very hyped up but I think CP has a lot to work on in terms of formula. I had high expectations for this because their Super Shock Shadows have such a unique formula and the pigmentation and lasting power hardly ever fail me. This is quite the opposite of what I expected but the shades in here are very cool toned so that might be something you can consider too. The palette consists of 4x1.4g/0.05oz of product and retails for $18. Bear in mind that a Super Shock Shadow has 2.1g/0.07oz of product so you are paying more for this palette. Plus, the quads that CP sell are also at $18 for 4x2.1g/0.07oz of product. This is the only satin finish in the palette so it has a slight sheen to it. It hardly shows up against my skin though so i can't say much about it. It has more pigmentation when used with a finger and almost nothing when used with a brush. I used this as my inner corner highlight and browbone highlight and the sheen really saved it because it does do the job in highlighting. This is also on the light/sheer side. It seems to have a purple base and the fallout is major when you use a brush with it. Again, there is more pigmentation when applied with a finger and less when applied with a brush. It was kinda hard to build it up also. It was just bent on remaining sheer. Ah yes, finally something with pigments! This is an intense dark green but you can definitely blend it out to soften the color. It has a lot of fallout too and it's actually quite chunky and patchy when you use a brush with it. This one is quite pigmented too and has slightly less fallout. It blends nicely but does apply patchy. It looks more like a plummy brown to me than a purple. 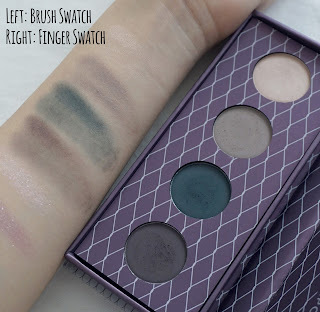 To compare the effects of swatching with a finger and brush, I used my e.l.f Eyeshadow "C" Brush to swatch the shadows. on the left side of the finger swatch. 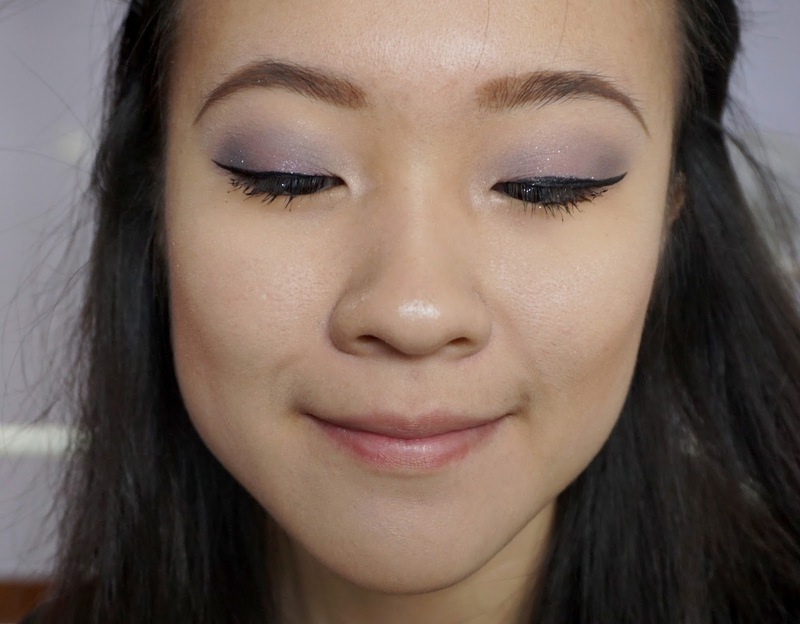 If you watched the video, I had to go over the brush swatches a few times and pack it on and blend it out to get this result. Washed everything off and decided to brush swatch it again and it's really just like that. So, as you can see, you will definitely get more pigmentation if you use your finger but you really have to pack it on and work it in to intensify the colors. They are definitely buildable and blendable but it does get patchy and mind the FALLOUTTTT! I did switch up and use a fluffier brush in the form of elf's contour brush and it helped to reduce the fallout but the shades applied pretty light. The brush did help to blend the shadows out, maybe too much, so if you need to concentrate the color in a certain area, then you would have to pack it there. This is the look I came up with. I have ColourPop's Flexitarian and Might Be on my cheeks as a highlight and contouring blush. The satin lip lasted through my lunch and some cups of water without fading weirdly in the centers or corners so that is a plus! You can definitely see the line where the lipstick ends but it's on the inside of my mouth so, who cares? Anyway, shadows don't really fade on my lids because my single eyelids do not fold and crease so I'm really not a good example for that part. So, ending off the post with all the shadow swatches together so you can compare them! Will you be getting any items from the collection?